Prepare to shimmy on down with tasteful tassels and fabulous fringing! Reminding us of a bygone era, our classic fashion inspired silk lamp shades will add personality, fun and unique wow factor to the home. 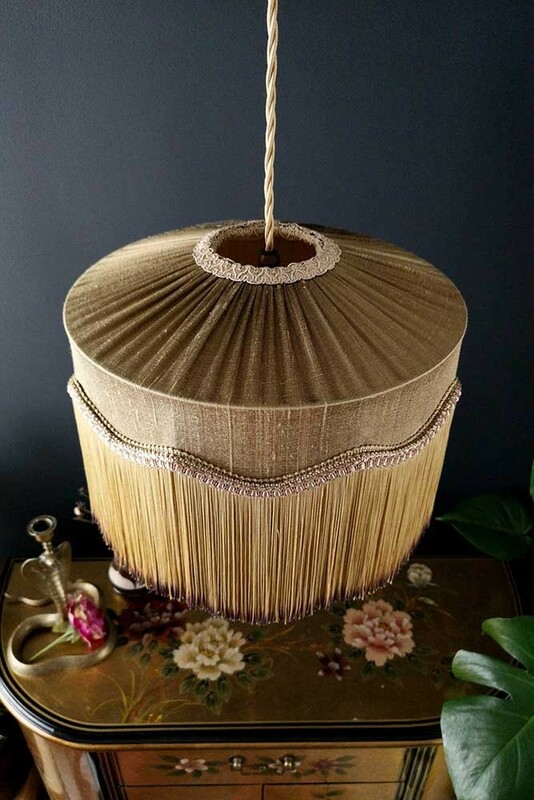 A striking and bespoke piece the Inca Gold Silk Tiffany Lamp Shade is 1920’s inspired with a choice of gold straight or gold wavy tassel fringing. 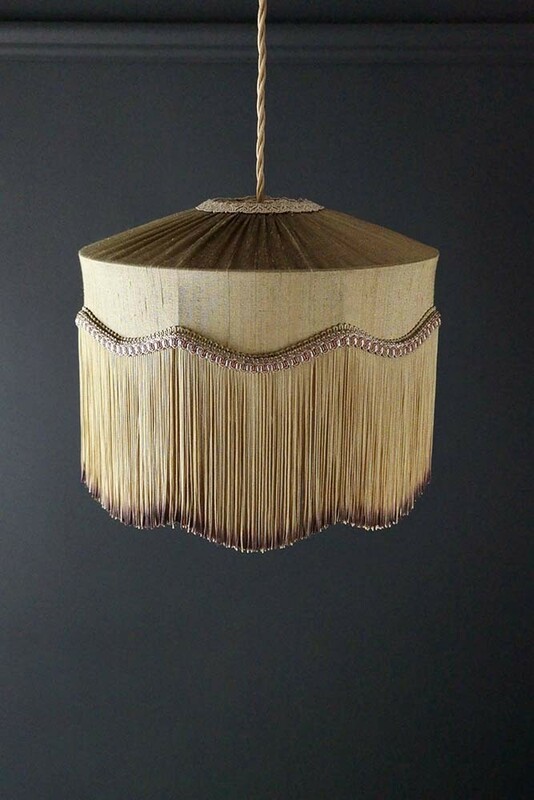 Perfect for table lights, floor lights and pendant lights this glamorous Gold Fringed Lamp Shade is hand-stitched around a bespoke bronze frame with a double layer dip-dyed tassel fringe. The lampshade is left unlined to allow the maximum amount of light to travel through the textured silk. Please note, that this lampshade is made to order and so has a 4-5 week lead time. 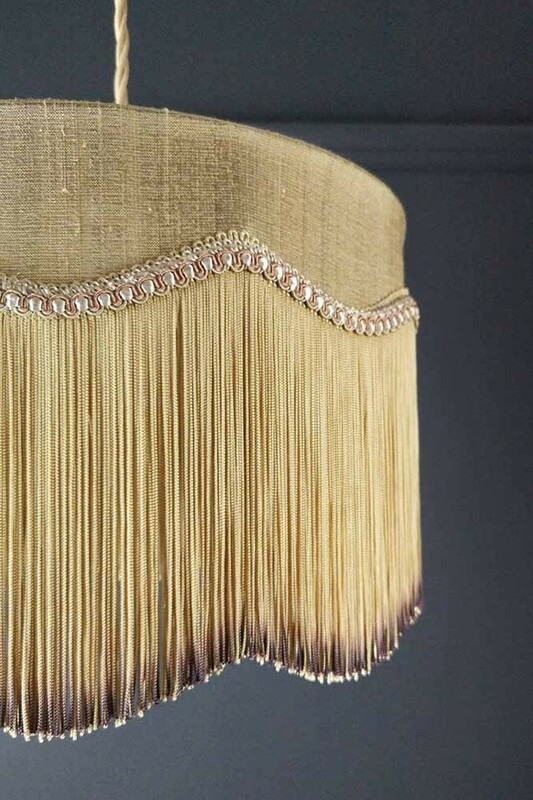 Really beautiful this Gold Fringed Lampshade is available in large, medium and small. The Gold Silk Shade is also sold with a choice of either a straight or wavy fringe. If you like to have a little fun with your home interiors, then you will love this lampshade! Adding fabulous texture as well as a golden luxe to your table lamps, floor lamps and ceiling lights this is a showstopping lampshade that is bound to turn heads. 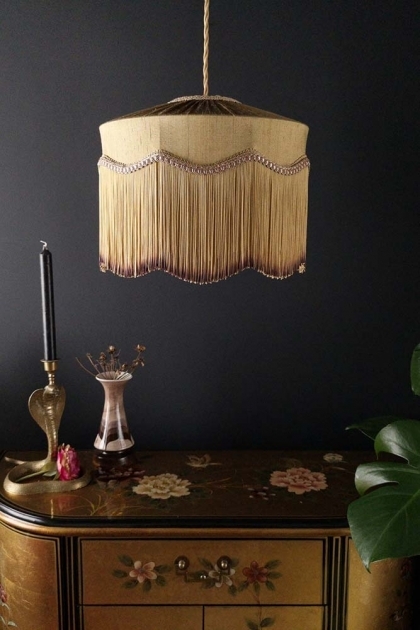 Something as damn fabulous as this elegant Gold Tassel Lamp Shade should not be hidden away. A great pendant shade for your central fitting lights, we think that this light shade could look really make an impact when hung in your hallways, entrance hall or over your dining table. Alternatively, this lampshade would make a great floor light lampshade adding a touch of sophistication to your style spots! *What fitting do you need? Small - Dia. 12" x H8"
Medium - Dia. 16" x H9"
Large - Dia. 20" x H10"
Lining: Left unlined to let out maximum light. Recommended bulb: B22 42W Globe Bulb as the shape is quite shallow. Please note, this product is excluded from any discount or promotional offer. For more information, please see our Terms & Conditions. Please note: a shade ring reducer may be required when you use this lamp shade with one of our lovely table lamps and floor lights. This item is bespokely made just for you & therefore will take 4-5 weeks to be delivered. For further delivery information, & Click & Collect opening times, please click here, call 01444 253391 or email contact@rockettstgeorge.co.uk and one of our lovely customer service team will be happy to help.